This is a tale of failure and the perfect embodiment of the saying: "When a window closes, another door opens." Basically, it's another one of my #bakingfails. Since I made the Japanese Strawberry Shortcake, I was determined to perfect my egg-white beating skills. It so happened that yesterday was a friend's house-warming, so I thought it was a good chance to make a Swiss Roll ala Chinese bakery-style. It's a deviation of the traditional swiss roll and usually comprised of a light-as-air and fluffy sponge cake that's only slightly sweet, and a thin layer of whipped cream and sometimes, strawberry jam. Not a swiss roll...but something you may see in a Chinese bakery. 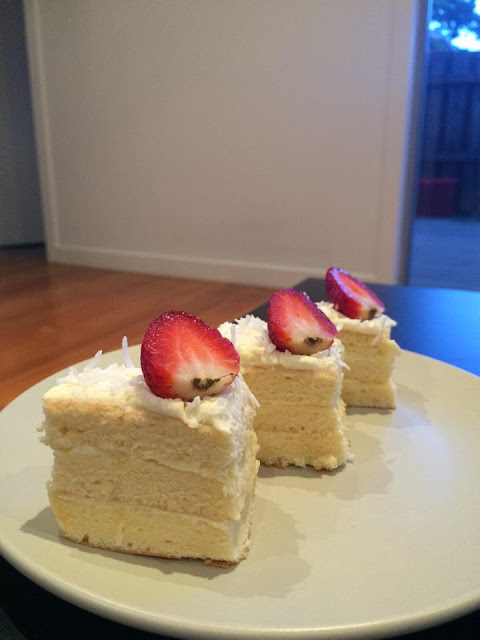 The recipe was easy enough to follow and pretty much a text-book sponge cake. I was over the moon that my egg whites were pearly, glossy and stood proudly at the end of my whisk. Seriously, I can never get sick of making meringue. It's pure magic! I stood the 9 x 13 inch cake pan in a shallow water bath and put it in the oven at 175 degree Celsius for 15 minutes. The result was a super fluffy sponge cake. "That was easy," I thought, naively. Then came time to roll up the swiss roll, which was when I was plunged from cotton candy heaven to chocolate soil earth: It cracked in half when I attempted to roll up the sponge! As any good Masterchef addict knows, when it's broken, you fix it! So I overlooked the cracked sponge and kept folding the rest of the cake. But instead of the beautiful spiral, I got a flat lump. At this point I conceded that I would've had to visit my friend's house empty-handed. But I was really reluctant to throw out a perfectly fluffy sponge cake. So I went to damage control mode and divided the sponge cake into 3, to make a layer cake. Not a swiss roll, but still pretty good. Instead of a regular cream, I filled the layers with some coconut milk-infused whipped cream, sprinkled some desiccated coconut, and topped it all with some leftover strawberries from the 89 cents strawberry punnet I got from Woolies. Tip: Glazing fresh fruit with sugar syrup helps to prevent fruit toppings from going soggy. Preheat the oven to 350 degrees (F)/ 175 degree (C). Sift together the cake flour, cornstarch, and baking powder. Sift them twice. It’s a necessary step to making this cake light and airy. Taking 1/3 of the egg white mixture at a time, fold it into the egg yolk mixture create a light and airy batter. Make sure everything is thoroughly combined. Line your baking pan with parchment paper. You can cut the four corners of the paper and overlap it to create smooth corners. Pour the mixture in the pan (I used a 9x13 inch pan) and smooth it out so it’s completely even. It’s crucial that the batter be evenly distributed in the pan. Knock the bottom of the pan on a tabletop a few times (you can cover the table’s surface with a kitchen towel to make sure you don’t break anything) to get rid of any large air bubbles. While the cake is baking in the oven, it's time to make the whipped cream! In a mixer, whip the cream along with 2 teaspoon of sugar until you get stiff peaks. Add 2 tsp of coconut milk and whip until combined. Chill the whipped cream in the fridge until ready to use. Divide and cut the cake equally in to halves or thirds. When the cake is still warm enough to be pliable but not warm enough to melt your cream, spread the whipped cream evenly onto the first layer. Place the second layer on top, and spread the whipped cream evenly onto the second layer. Repeat if you have a third layer. 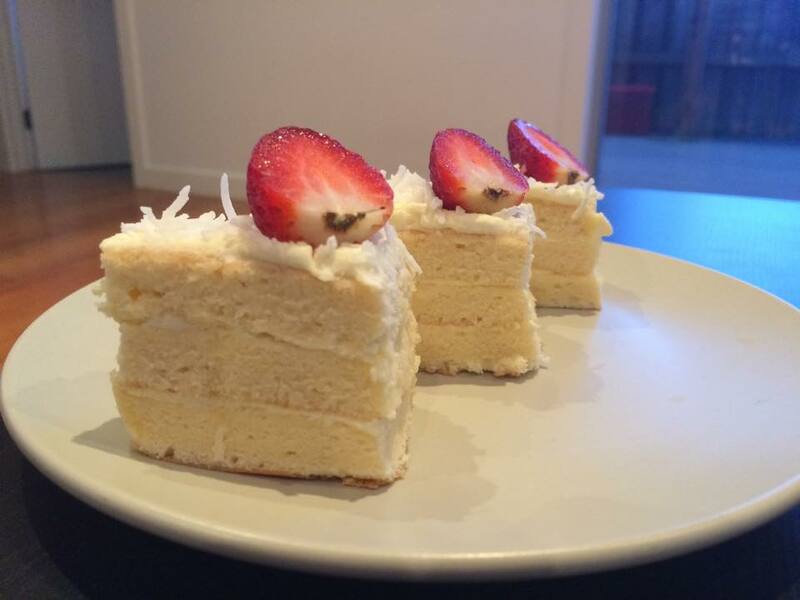 Frost the top of the cake, sprinkle the desiccated coconut and top with strawberries, then serve!